Global Advanced airport display system is majorly driven by the growing adoption of passenger mobile applications. Global Dead Sea mud cosmetics market was valued at USD 1.2 Billion in 2015, and is expected to reach USD 3.2 Billion by the end of 2024. The demand for IoT Platforms are rising as the businesses are shifting towards cloud technology to manage their data. Consult directly with our domain leaders and get expert advice regarding the upcoming market. Customize the report as per your requirements and area of focus to avail great benefits for your business. "The quality of representation was outstanding. I never thought that understanding a complex market can be that much easy"
"More than just selling a report, the team was more focused towards the understanding of my requirements. Regular updation was the best part." "Hats off to expert analysis, the team was very supporting and thanks for not charging me on additional data." " I really want to thank Goldstein Research for their efforts to make my project successful. F2F discussion with the market experts was excellent. Keep up the good work guyz "
United States is a technology advanced country with its high penetration rates. Since the birth of television, it has been the major source of entertainment. With the technology advancement, there is growing era of smart homes and smart offices with smart TV being an fundamental part to it, which along with serving its original purpose of entertainment, it also works like a DVD player, music player, running internet based applications, transforming it into a computer such as streaming videos from Amazon TV, Netflix, Hulu and Google play store. Though smart TV functions are important but the screen size, display type and resolution are also important factors impacting the preferences of the customers. It is estimated that nearly 45 million households in U.S. have smart TV. High personal disposable income of the people of consumer electronics and their shifting preference towards smart environment (homes and offices) are majorly driving the growth of the market. In 2017, Globally 245.1 million smart TV shipments were recorded, with U.S. acquiring the major share. United States has huge internet penetration, thus on an average the people of U.S. spends 2-3 hours on smart TV and further 4-6 hours on other internet connected devices such as chromecast. Goldstein Research analyst forecast that the United States smart TV market is set to reach USD 41.6 billion by 2024, growing at a CAGR of 4.5% over the forecast period (2017-2025). Flat screen type smart TV accounted for largest market share of 53.6% in 2017, due to its lower price and high demand majorly among the middle income group of people. But over the forecast period curved screen type smart TV is expected to take over the market share on the back of being technologically advanced and the expected growth in the personal disposable income of people. The report covers the present ground scenario and the future growth prospects of the smart TV market in United Sates for 2017-2025 along with the market players’ analysis. We calculated the market size and revenue share on the basis of revenue generated from major players in the United States region. 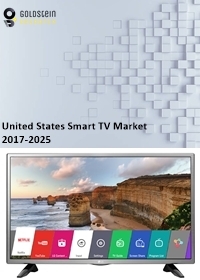 United States smart TV market is forecasted on the basis of smart TV production and supply. United States Smart TV Market Outlook 2017-2025, has been prepared based on an in-depth market analysis from industry experts. The report covers the competitive landscape and current position of major players in the United States smart TV market space. The report also includes porter’s five force model, SWOT analysis, company profiling, business strategies of market players and their business models. “United States Smart TV Market Report” also recognizes value chain analysis to understand the cost differentiation, pricing models to provide competitive advantage to the existing and new entry players. Our United States smart TV market report comprises of the following companies as the key players: Sony, Samsung, LG Electronics, Panasonic, Koninklijke Philips N.V., Haier Consumer Electronics Group, Hong Kong Skyworth Digital Holdings, Logitech International, Onida Electronics, Toshiba, Videocon, Hitachi, Ltd., Hisense, TCL, etc. The study was conducted using an objective combination of primary and secondary information including inputs from key participants in the industry. The report contains a comprehensive market and vendor landscape in addition to a SWOT analysis of the key vendors. For a full detailed overview, send us the sample request. What is the total market size by 2025 and what would be the expected growth rate of market? What is the total revenue per segment and region in 2015-16 and what would be the expected revenue per segment and region over the forecast period? What are the key market trends? What are the factors which are driving this market? What are the major barriers to market growth? Who are the key vendors in this market space? What are the market opportunities for the existing and entry level players? What are the recent developments and business strategy of the key players? Need more information about this report ?